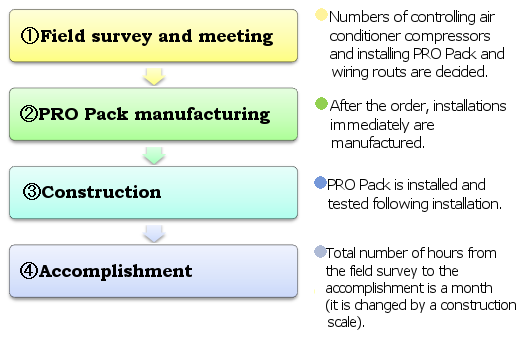 PRO Pack installation guide-Yakey Co., Ltd. Cost of PRO Pack installation (including installation and construction charges) is approximately 1.5 ~ 2 million yen. Consumer contracts electricity less than 50 kW cannot install PRO Pack. In Electricity Business Act, electricity over 50 kW contract is called Actual electricity energy contract and PRO Pack is only installed by the contract. In the case of that consumer has a cubicle. This case must be Actual electricity energy contract and the target of PRO Pack installation. Firstly, we make an approximate estimation and if you are accepted, a detailed estimation is made by the field survey. It is possible that the detailed estimation is different to the approximate estimation. Please send us following documents by fax and we immediately make estimation. We appreciate you that tell us capacitance (kW) and number of air conditioners and cooling machines. ①Floor plans of the building If possible, we appreciate you that tell us installation locations of contracted electric meters (demand meters) and all air conditioners and cooling machines. ②Digital photographs of installation location and circumference of field air conditioners and cooling machines.